James Bach, a legend in the software-testing field, just published Secrets of a Buccaneer-Scholar, the tale of how he dropped out of school, became a self-taught games programmer, and scored a sweet gig at Apple—all before turning 21. In May of 1987, nearing my twenty-first birthday, I was down to my last hundred dollars, and the only marketable skill I had was for [programming video games,] something I could no longer force myself to do. Then a recruiter called. She'd found a resume I had sent months before. Would I like a job in Silicon Valley? "I thought the industry had taken a downturn. Aren't there programmers starving in the streets of Sunnyvale?" No, actually there's lots of work available. Would I like a job at Apple Computer, for instance? "Sounds wonderful. What kind of work is it?" All feelings of burn-out were instantly replaced by a blazing electric neon YES in my heart. Apple Computer needs me. Needs me. I am being called to service. The job was managing a team of testers. "What do you mean, testers?" I asked the telephone. The recruiter explained that testers examine a product someone else has created and find problems in it. "They pay people to do that?" Interesting. I'd always tested my own work. Then again, I'd never worked on a team with more than two other people. In terms of the software industry, I was a crazy-eyed mountain man. On the way to Apple I bought a copy of The One-Minute Manager. It looked thin enough for rapid learning. I skimmed it as well as I could in the hour before the interview. I'd been worried about my clothes. I didn't own a suit. But looking around, I fit right in. Everyone was dressed like me. Two guys in a conference room asked me questions. I answered them and showed the portfolio of games I'd worked on. When they asked me about management, I repeated some of what I'd read in The One-Minute Manager. When they asked me about testing, I said what every programmer says: "I've tested my own stuff." Its not a good answer, but I didn't know that. Neither did they. No one in that room knew much about software testing. There are no university degrees in it. It's one of many new crafts that have emerged along with modern technology. After the interview, I went outside and walked twice around the building. This is where I belong, I thought. I will rock this place. Please please please hire me. A couple of days later, they did. I was a nervous man on my first day at Apple. At twenty, I was the youngest manager in the building. In all the gatherings and reorganizations we went through during the four years I worked there, I never met a younger manager. I was younger than many of the interns. Also, I was a contractor. That meant Apple could fire me without notice or severance. I had little money and no credit. The worst thing was that nearly everyone around me had a university degree. A good many had graduate degrees. I had to catch up to the college kids. I brooded on it every day. I came to work with desperate fire in my soul to learn. Learn everything. Learn it now. As a manager, I supervised five testers, but no one closely supervised me. My boss, Chris, was in meetings most of the time. He needed me to get on with the work as best I could. This meant I could sneak away and read. I spent part of each afternoon in a donut shop across the street from my building, studying without interruption. Chris was supportive. "You should not just read about software," he suggested. "Try to find solutions to our problems in other disciplines." Maybe Chris was more supportive than he ever knew. I treated that one casual suggestion as permission to spend work time to learn anything. I browsed many of the two hundred or so academic journals that came through the library. Even crazy stuff. I read "Anthropometry of Algerian Women," and "Optimum Handle Height for a Push-Pull Type Manually-Operated Dryland Weeder." Of course I read every testing book I could find. I discovered software testing standards and studied those, too. I studied most evenings and weekends. At first I thought I would learn a lot from the other testers. There were more than four hundred of them in my building. But talking to them revealed a startling truth: nobody cared. The pattern I experienced at Apple would be confirmed almost everywhere I traveled in the computer industry: most people have put themselves on intellectual autopilot. Most don't study on their own initiative, but only when they are forced to do so. Even when they study, they choose to study the obvious and conventional subjects. This has the effect of making them more alike instead of more unique. It's an educational herd mentality. I talked to coworkers who wanted to further their education, but they typically spoke in terms of getting a new piece of paper, such as a bachelor's degree, a masters, or a PhD. For them, education was about the doors they believed would open because of how they were labeled by institutions, not about making themselves truly better as thinkers. Buccaneers, on the other hand, don't take labels too seriously. 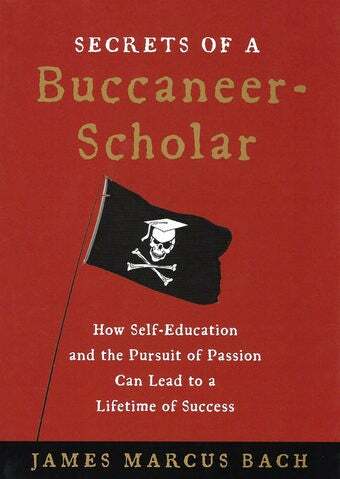 A buccaneer studies in the hope of unlocking Great Secrets! Wonder! Mastery! A buccaneer lives for the excitement of deciphering the mysteries of human experience. A buccaneer wants status, too, but only if that status is justly earned and sustained through the quality of his work. The $13 book is a wonderful read, especially for people who take education into their own hands—or would like to. There are so many brilliant people for whom the structure of school simply doesn't work, and it takes an eloquent geek like James prove to people in similar situations that this isn't their fault, and that they can do something about it. You can check out more on James' website, and you can follow him on Twitter at @jamesmarcusbach. Thanks again, James—and yo ho ho, matey!